“Redirack were excellent throughout the project. They thoroughly deserved to get the business.” These are the words of Bill Brierley, Managing Director of The RoDO Group, a family owned business, which supplies decorating products. From paint brushes and decorating tools through to workwear and dust sheets, RoDO is the one stop shop for every retailer of decorating equipment. The company includes most of the leading national chains among its customer base, as well as smaller independent regional stores. The result is a storage system, which has 7500 pallet locations, the main block of racking is in the building’s second chamber and makes full use of the available height, rising to more than nine metres in the centre. In this area there are four double runs and one single run of racking. Each run has thirty bays, accommodating three 1000 x 1200mm deep pallets at each level. Pallets are stored on six levels, including the floor, on the two centre aisles and five high throughout the rest of the chamber. 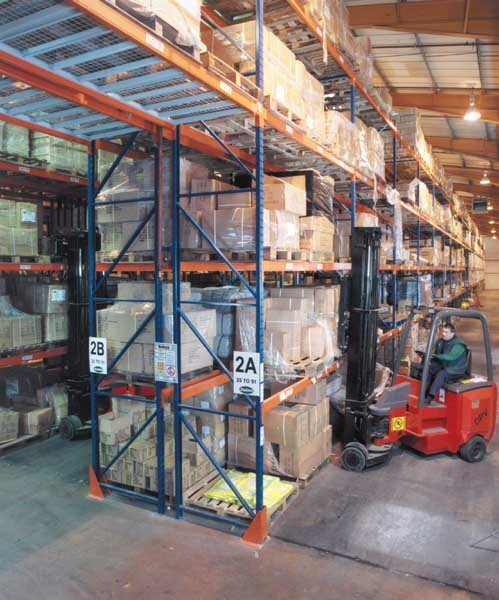 The racking is serviced by three Bendi fork lift trucks, operating in 2.3 metre wide aisles. This area provides bulk storage and replenishment for the picking faces, housed in the first chamber. The picking area covers both floors of the first chamber. The lower floor is laid out with a mix of two high racking, for items picked direct from the pallet, and a block of shelving for all the smaller items. The upper floor is mainly given over to pallet racking and is used to store items, such as dust sheets, which are normally shipped out as full pallets. Pallet gates are located on the upper floor. With the gate in the open position a forklift truck loads the pallet while the barrier on the upper floor provides protection. 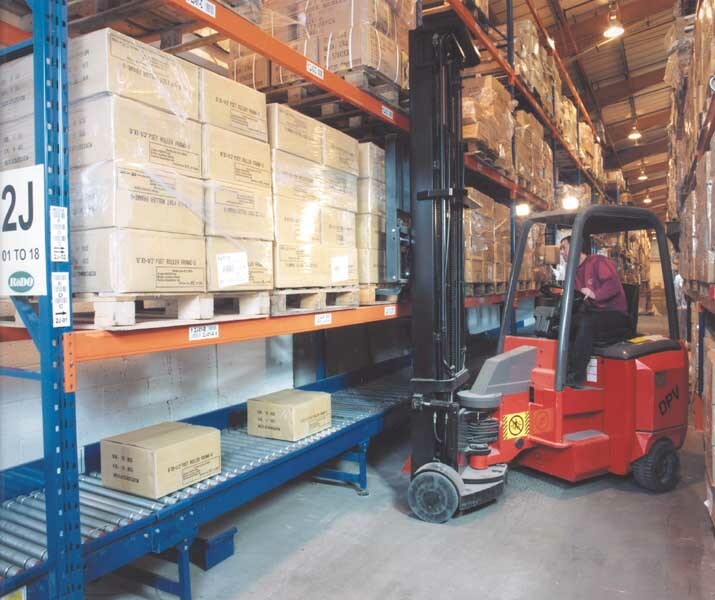 After loading, the forklift truck moves away and the operator manually moves the gate into the closed position. The pallet can then be moved into the storage area. The process is reversed when a pallet needs to be moved to the despatch area. Due to the building’s layout, once packed, items have to be transported to the loading bays on a conveyor. In order to minimise its impact upon the storage space, the racking is actually built around the conveyor for a part of its run. 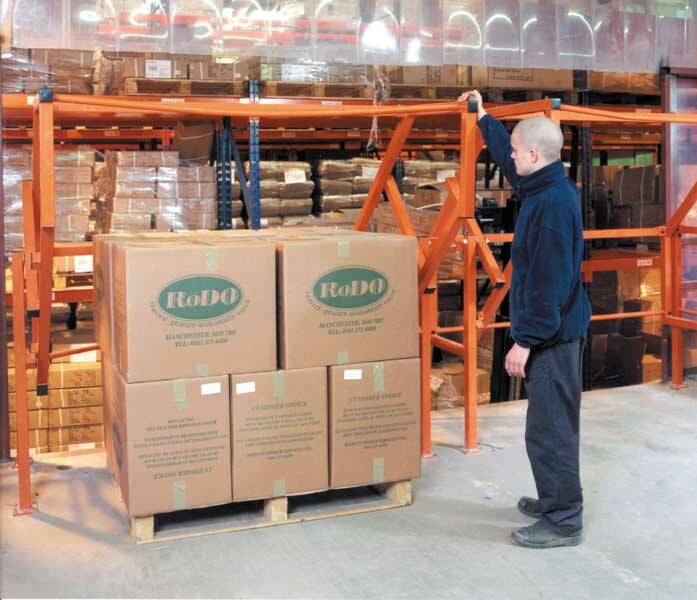 Whilst the new distribution centre only opened for business in January, RoDO were quickly reaping the benefits. “With Redirack’s help, we have a system that completely meets our needs. The Redirack team was excellent. They managed the whole project and liaised with all the other contractors to ensure that the installation went as smoothly as possible.” Wayne concludes.